Handy bullet points! Yes, you should all be upset but this isn’t a surprise. My email and twitter are going wild which can only mean there’s been a big antiquities bust of some kind. And so it is: Federal prosecutors have filed a complaint against Hobby Lobby/David Green (of Museum of the Bible and stripping women of access to birth control infamy) to the tune of 3,450 Iraqi tablets and $3 million dollars. I’ve got a busy day ahead of me, but I’ll offer up a few bullet points on this case. Note, I was not a consultant on this case, I didn’t investigate it, and (full disclosure) the Green Collection once paid for my (plus other experts’) dinner, even as we criticised them. If you have further questions, email me. You can’t collect antiquities without risking buying looted ones. Every purchase is a risk. Best just not do it. You can’t collect antiquities on the scale of the Greens (MASSIVE SCALE) without certainly buying a lot of loot. This is common knowledge held by everyone in the trade. The antiquities trade runs on layers of “plausible deniability”: not asking too many questions, leaving things implied but not said, opaque business practices, lack of regulation. Claims of not understanding the law are not an excuse for breaking it; don’t be fooled by this. In this case the Greens had advisors and independent experts who told them, flat out, that these purchases were wrong. They did it anyway. Why do it then? Well we have a lot of research on the topic. Basically, the Greens were probably able to neutralise their actions by convincing themselves that they were above the law because they were buying the antiquities for magical Evangelical purposes, saving them from the darkness of obscurity in a non-Christian country. I mean, that is speculation, their neutralisation technique might be a bit different, but it’ll be something along those lines. It always is. Yes, this is white collar crime. They expected to be shielded by their wealth and social capital. This is not a surprise, it is a while coming. This case has been going on for a few years now and there have been bits and pieces of news stories about it. 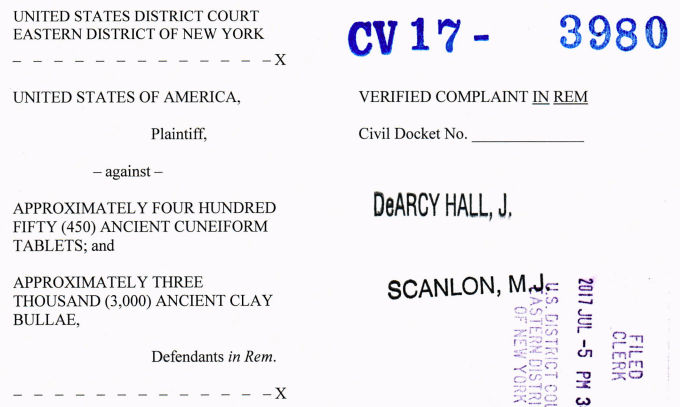 I had fantasies during the Hobby Lobby birth control case of taking them down with antiquities and told everyone I knew “you know they are terrible antiquities collectors too…” but that wasn’t the story at the time. This story has nothing to do with IS. These antiquities were not looted by IS. IS is not the centre of the antiquities looting and smuggling world, they just are in the press. Iraq has been looted for a long time. 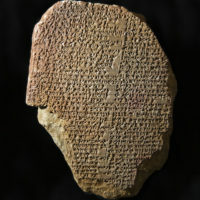 Cuneiform tablets have been a hot commodity. No, I don’t know where these came from. Hopefully some cuneiform experts will weigh in. Yes, I do think that there are looted antiquities in the Museum of the Bible. I think there are lots and lots of looted antiquities in there. I can’t prove it to an extent that would let some country make a return claim, but please understand: there is no legit source of these kinds of artefacts. Not on that scale. Looting is the source and lack of provenance is the proof. It seems shocking that the cuneiform tablets were declared as tile samples for customs, but this is almost textbook antiquities smuggling procedure. “Handicrafts” is common. Disgraced antiquities dealer Subhash Kapoor went with declarations like “Marble Garden Table Set” for shipments that contained stolen Indian idols. Return of that many artefacts and $3mil is more than the usual slap on the wrist. We’ll see if it happens. That said, Google tells me that David Green has a net worth of $5.7 billion so he won’t feel it. He may not feel a lot of social shame either. For this level of white collar criminal, I wonder if even a tiny sliver of jail time is a more effective deterrent. You heard me, dodgy market-end folks should go to jail, not low-level antiquities looters. It’s all about what is effective folks. Sadly, it never works out that way. We’ve all experienced a loss here. Because people like Green are willing to buy these things, the rest of us lose a massive amount of interesting information about the ancient past. These tablets have no context. Were they bits and pieces looted from many sites? Were they all one library? Did the looters trash crumbly tablets that weren’t pretty enough for the market but, in the hands of archaeologists and epigraphers, could have told us marvellous and ground-breaking things? What else was WITH the tablets? We don’t get to know because a rich guy felt his desires were more important than history and heritage. There you have it, some quick early-morning notes. Again, if you need more info on the topic, get in touch with me. We discussed if this was an ethical violation at the time, but settled on ‘paying for our food is the least they owe us and everyone else at this point’. It didn’t change how much we slammed them. If you are a multibillionaire that seeks to pay an independent expert to tell you not to buy antiquities, I’m your woman. Actually, I’ll give it away for free: don’t buy antiquities. If you like the ancient past, fund archaeological digs with your money or pay for upgrades to museum facilities and heritage training in low income countries.